LG Launched his new smartphone LG K10 (2017) model in India. The device was available across all offline stores now. However, LG K10 will very soon hit the online stores as well, may be around next week. The key highlight that would attract most of the consumers is the inbuilt SOS panic button. This being said, the LG K10 becomes the first ever device to come packed with a panic button. 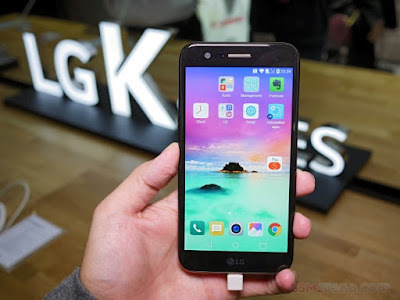 The SOS button fitted inside the LG K10 will help the users in an emergency situation, by allowing them to make emergency calls to some select contacts when need be. LG K10 is designed to promote women safety in the country. As per the specifications, LG K10 sports a 5.3-inch HD In-cell Touch display paired with a 2.5D Arc Glass design. While on the camera front, the device features a 5MP selfie shooter in the front and fits a 13MP rear camera with LED flash. Furthermore, LG K10 is powered by a 1.5 GHz Octa-Core MediaTek MT6750 processor and is backed by 2,800mAh removable battery. In terms of the storage capability, the handset sports two variants - 16GB and 32GB internal storage unit, both are paired with a 2GB RAM. The storage space can be further expanded up to 2TB via a microSD card. Running on Android 7.0 Nougat, LG K10 (2017) has been launched in India in three color variants, which include - black, titan and gold.